One appraisal company, at least, has collected monies owed by the now defunct appraisal management company (AMC) AppraiserLoft. How did they do it? They did it by citing chapter and verse of FIRREA. C. Brent Chitwood, office administrator for Phoenix Real Estate Appraisal in Irmo, South Carolina, says he was able to get a mortgage company to reimburse his appraisal firm for monies unpaid by AppraiserLoft after pointing out that FIRREA requires contracts be with licensed real estate appraisers. FIRREA, the Financial Institutions Reform, Recovery, and Enforcement Act of 1989, targets appraisal reform and includes the establishment of appraiser licensing. According to Chitwood, the argument that a client must pay when an AMC does not is pretty clear under FIRREA and Supplemental Standards. This is from the correspondence Chitwood sent to the mortgage company: “The issue of responsibility for payment appears to be in question. We are providing you with our research to assist you in understanding our position in this matter and the legal precedence that we will use to pursue collection. (1) You are required under FDIC Rules and Regulations Minimum Appraisal Standards 323.4 to use a State Licensed Appraiser for this loan. (2) As state licensed appraisers, we are required to identify the client and the intended user by USPAP, the Uniform Standards of Professional Appraisal Practice. This was done by obtaining that information from your agent. The client (you) is documented in the client section of the appraisal that is part of your files. (3) You are required by law and rule to contract with a state licensed appraiser either directly or through an agent. See 323.5 (b). You may not contract with a party that is not a state licensed appraiser or its DBA. So AppraiserLoft, a regulated AMC, is either your agent or you have violated this provision. (5) The transaction took place between Phoenix Real Estate & Appraisal, Inc. as the appraiser legal entity and xxxx Mortgage as the client. AppraiserLoft acted as your agent to order, review and assure compliance with your specific requirements. After hearing the argument, the mortgage company promptly paid Phoenix the monies owed ($300). “It worked for us and I’d like to see it work for the whole bunch of others who lost money working for AppraiserLoft,” Chitwood says. Read AMC Bad Debt- Lenders Responsible? 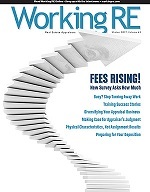 to read about another appraiser who isn’t taking no for an answer when it comes to fees owed. For FDIC Sections 323.4 & 323.5, visit FDIC.gov; Laws and Regulations.